After a 2016 Kids Count report ranked Kent County 26 out of 83 Michigan counties for child well-being, First Steps Kent launched a campaign to inform the community and help make sure kids are ready for kindergarten. NPO Showcase - First Steps Kent from GRTV on Vimeo. NPO Showcase highlights nonprofit and government organizations and the work that they're doing in our community. The program is a feature of GRTV, a service of the Community Media Center. You can catch it on GRTV on Saturdays at 8 AM and 6 PM and can view past episodes on Grand Rapids Community Media Center website. If your nonprofit would like to be interviewed on NPO Showcase, please contact Adrian Hirsch. 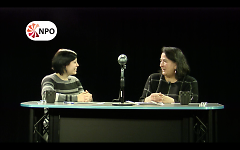 This week’s episode of GRTV’s NPO Showcase features Annemarie Valdez, Executive Director at First Steps Kent. Valdez discusses some disappointing Kent County statistics related to child well-being and reading proficiency and First Steps Kent’s new campaign to raise awareness and address these issues. Kent County ranked 26 out of 83 Michigan counties for child well-being in 2016, according to a recent Kids Count report. In response, First Steps Kent launched their “Reading, Writing, and a Reality Check” campaign. “We want the community to know that they can make a difference, and here in Kent County, we can do better. But right now, there’s a lot of work to do,” Valdez said. First Steps Kent works with early childhood providers in Kent County to ensure that there are quality pre-school programs for kids, starting at birth, and that kids are ready for school once they reach kindergarten. Third grade reading proficiency is an indicator that a student will graduate high school, which impacts success in entering the workforce. In Kent County, 33 percent of students are not reading proficiently by third grade. And it’s best to intervene early – 80 percent of a child’s brain is developed between birth and age three. While the “Reading, Writing, and a Reality Check” campaign is bringing awareness to some alarming issues that Kent County kids face every day, First Steps Kent wants the community to know that these statistics can be changed. For example, parents can read to their children, and access quality pre-school programs to help make sure their kids are ready for kindergarten. And as a community, we need to invest in early childhood and literacy programs. You can learn more about the campaign in the NPO Showcase episode above. You can also visit the First Steps Kent website to learn more and access resources about early childhood education. Check back next Wednesday for a new segment of GRTV’s NPO Showcase, featuring the Ronald McDonald House of Western Michigan. NPO Showcase is just one of the many ways that the Community Media Center serves the nonprofit community. For information about this and other CMC services for nonprofits, or to schedule a future interview, contact Nonprofit Outreach Coordinator, Adrian Hirsch, at 616.459.4788 x105 or email [email protected].